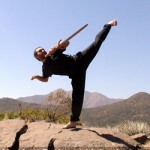 Boabom is a system of moving meditation, active relaxation, and self-defense.Its teachers stress that, while the movements learned in the art could effectively be used in a combat situation, the central aim of the practice is to heighten bodily awareness and help the student attain an optimal state of health, energy, and vitality. This teaching is also described as a science of physical and mental development, a technique of self-medicine through movement, relaxation, meditation, and various forms of physical and psychological self-defense. Boabom or Osseous Boabom is a system of quick movements focused on speed and agility. It is often called the 'Art of Self-Medicine through Self-Defense'.This branch is dedicated to the study and practice of movements that develop fast reactions, agility, self-control, balance, speed, precise reflexes, spontaneity, breathing, concentration. Also, the teaching differs from other systems for its movements are taught in a progressive way, resembling a chain in which each new movement learned is linked to the previous one. Seamm-Jasani or Gentle Boabom is a slower, calmer system that consists of slow and fluid exercises that improve coordination and balance, and help to build an equilibrium between body and mind through various techniques of breathing and movement. Yaanbao is a Boabom practice involving the use of implements. In this Art one studies the perfection of the movement, its solidity, while using different types of sticks (which differ both in length and in shape) as an extension of the body.